The following is a slightly modified version of a story that was originally published on IFPRI’s Food Security Portal. Cross-posted from IFPRI Blogs. The last ten years have witnessed incredible economic and agricultural growth in Africa. Between 2000 and 2010, the continent was home to six of the ten fastest-growing economies in the world. However, can this growth continue in a sustainable, inclusive way? Yes, if managed carefully through strategic investments in infrastructure and stable financial institutions, according to Njuguna Ndung’u, Governor of the Central Bank of Kenya, who spoke at the 17th Annual Conference on Global Economic Analysis. The conference, co-organized by the Global Trade Analysis Project (GTAP) and the African Growth and Development Modeling Consortium (AGRODEP), and held from June 18-20 in Dakar, Senegal, brought together 194 economists from 52 countries to discuss issues of food policy, trade, and economic vulnerability, with a particular focus on Africa. In addition to Governor Ndung’u, plenary speakers included Ousmane Badiane, IFPRI’s Director for Africa. Researchers from IFPRI’s Markets, Trade and Institutions Division presented an organized session on food security and international trade, and IFPRI was further represented by presenters from the Development, Strategy and Governance Division, as well as from the West and and Central Africa Office. Given the event’s emphasis on issues impacting Africa, one of the conference organizers’ biggest goals was strong representation from the continent’s scholars. 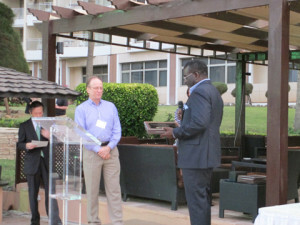 “From the beginning, we recognized the importance of connecting African researchers to this credible, high-quality international research network,” said Antoine Bouet of MTID. This emphasis paid off, with 50 participants coming from across Africa. Forty of them received scholarships to attend from the United Nations Economic Commission for Africa (UNECA), the World Trade Organization (WTO), AGRODEP, and IFPRI’s Food Security Portal. This marks the first time that economists from developing countries have been provided with financial assistance to attend GTAP’s annual conference. GTAP is a global network of researchers and policymakers who conduct quantitative analysis of international policy issues. Previous conferences have been hosted by the World Trade Organization (WTO), United Nations regional commissions in Africa, Latin America and Asia, the United Nations University in Helsinki, and World Bank Headquarters, according to GTAP president Thomas Hertel. This year’s conference, which was sponsored and supported by the CGIAR Research Program on Policies, Institutions and Markets (PIM), IFPRI’s Food Security Portal, UNECA, the World Bank, and the WTO, was the first such conference to be held in Africa.